I'm all for rituals, so I decided I'd begin my next big writing project with one. 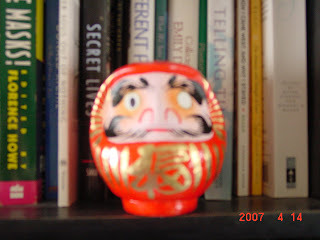 I bought a papier mache daruma doll and colored in one eye, as per custom. Often, Japanese politicians color in an eye of a daruma as they embark on a campaign and then color in the other eye after they've won the election. I'm going to color in the other eye after I've finished the novel that I've just begun to write. (It may be a long, long, time, but I look forward to that day.) In the meantime, I've thought of some other little things I can do to mark my progress, such as bottle of champagne after every 5,000 words. It'll have to be the cheap kind, though. My daughter likes the daruma and signed that she wants one, too. "What will your goal be?" I asked her. "To work hard at math?" "No," she signed. She's going to write a book, too. Sounds great as long as you keep it to the daruma and don't start emulating the politicians by driving down the streets with the sirens blaring out your name over and over again! Suzanne, what a wonderful post! I didn't know about this coloring-in-the-eye tradition. And how great that your daughter's goal is to write a book. Wonderful!! I want one too now. Don't worry Jean. I've always said that if I could vote, I'd choose the candidate who created the least amount of noise pollution. Hi! I have been enjoying your blog from Saitama, Japan. I just thought it is so cool your daughter wants to do what you seem to love doing - writing! I hope my little girl (who just ripped the fusuma up) will want to do something that I love in the future. I'm all about the rewards! And treats, too! Why not, afterall? It makes life so much more fun. Good luck on the new book...I'm sure it will be amazing! Your wish is made you paint the left eye of the Daruma. When it comes to pass, you paint in the right eye of the daruma. It should be burned at that New Year. It seems to me that traditionally one paints the right eye of the Daruma (ie: on the viewers left when facing the Daruma) when setting out toward a goal, and the Daruma's left eye when the goal is reached.